Triathlon - 22. February 2008. Vancouver, Canada (February 18, 2008) - With exactly six months to go until the Triathlon competition at the Beijing Olympic Games, the International Triathlon Union (ITU) launched its official Olympic website, www.triathlon.org/olympics. "As we near the pinnacle of our sport, we recognize that attention on triathlon will be at a premium so we created this website to satisfy the appetite for Olympic news and updates," said Loreen Barnett, ITU Executive Director. "Our media team has done a marvelous job of developing the site to be the first destination the public and media would visit for everything related to Olympic triathlon." The site contains an abundance of useful information and the latest Olympic news for the media and fans including a continually updated list of athletes nominated to their Olympic teams (with full athlete profiles) and a breakdown of the complex qualifying process. Course maps and elevation charts are available to help better understand the layout of the Beijing triathlon venue. The site also includes videos, interviews, photo galleries and race reviews from both the Sydney and Athens Olympics triathlon events, as well as all three Beijing test events from 2005, 2006 and 2007. The women's triathlon competition will take place at 10am (Beijing time) on August 18, day 10 of competition. The men's race will start at 10am (Beijing time) on August 19, day 11 of the Olympic Games. ITU's Olympic qualifying concludes with the 2008 BG Triathlon World Championships on June 6-8 in Vancouver, Canada. 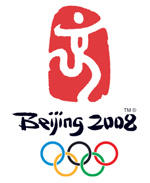 Beijing 2008 will be triathlon's third Olympic Games and will feature more athletes than ever before with 55 men and 55 women. Sydney and Athens each had 50 men and 50 women.